Rux Martin/Houghton Mifflin Harcourt, 9780547615622, 336pp. Michael Romano is the culinary director for the Union Square Hospitality Group and co-owner of Union Square Cafe, which won a James Beard Award under his direction. With Danny Meyer, he wrote the James Beard Award-winning Union Square Cafe Cookbook and Second Helpings from Union Square Cafe. He was inducted into Beard Foundation's Who's Who of Food and Beverage. Karen Stabiner is an adjunct professor at Columbia's graduate school of journalism. Her work has appeared in Saveur, the New York Times, the Los Angeles Times, Vogue, and Travel & Leisure. She is the co-author of The Valentino Cookbook. Considered by the New York Times to be "the greatest restaurateur Manhattan has ever seen," Danny Meyer is CEO of the Union Square Hospitality Group. His restaurants have won an unprecedented twenty-one James Beard Awards. His book, Setting the Table, was a New York Times bestseller. "Part haute cuisine, part comfort food, dinners that chefs whip up for their kitchen- and waitstaffs before the evening’s guests pile in serve as an object lesson in thoughtful meal planning." "Before restaurant chefs cook for you, we cook for ourselves. What we prepare for our fellow chefs and staff is every bit as important to us as what we make for guests when the dinner service starts. With this wonderful book devoted to the meals he makes for his own restaurant family, Michael Romano gives us an intimate look at the dishes that are closest to his heart: food that is personal, generous, and nurturing. Family Table isn¹t just a source of delicious dishes. It¹s a beautiful reminder of what cooking and eating are all about." "I always say to my team, ‘Cook the staff meal with the same care as if you were going to serve it to your mother.’ The stories and recipes in this book really encapsulate the passion that chefs should show while preparing their ‘family’s’ meals." 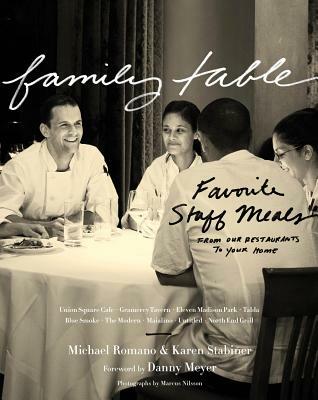 "Family Table gets the mouth watering at first read: Here are recipes that are approachable but blessed with little twists and turns to pique the palate."